So the legend of Ed Leedskalnin goes, he claimed to know the secrets of the Egyptians and had harnessed a form of anti-gravity magnetism to lift immense blocks of limestone weighing up to 30 tons. Ed had only received an education up to grade four and had come from a poor Latvian family, however despite a lack of formal schooling Ed was a sponge that soaked up everything around him. He learned the family trade of stonecutting and by the time he reached adulthood he was an expert in everything from tombstone cutting to working on the finest stone castles in Latvia. After being left at the altar by Agnes Scuffs (his sweet sixteen) in his early 20’s, Ed decided to move to the US from Latvia. Ed wandered North America for a while, ending up in Cranbrook, British Columbia for a time before heading back into the Spokane area to work in the lumber trade, where he most likely contracted tuberculosis that would plague him for the rest of his life. In the winter of 1922-23, Ed purchased 2 acres of undeveloped land in Florida City and began a twenty-year construction project known today as Coral Castle, though Ed never called it that. 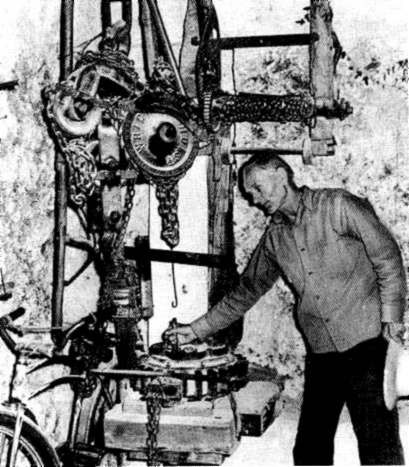 The construction was done entirely in secret, and appeared to be operated by one simple hand crank attached to a magnetized flywheel... This intriguing apparatus was accompanied by other strange elements: A tripod with the mysterious box on top with levers and pulleys extending downward into the pit where Ed would quarry his limestone blocks, and neighbors reported singing coming from the property during times Ed was at work. However, Ed’s most amazing feat came in the 1930’s when he decided to move his beloved Coral Castle to a new, more private location. Ed hired a driver to help him move the blocks to the new location and insisted on complete privacy, always moving the blocks by himself. In one instance the driver came back early and unexpectedly to find all the blocks loaded – within a mere half hour!! The mystery grows deeper as Ed always used a secret code for his notes and many works of writing, none of which have been successfully deciphered. Many believe Ed’s riddles contain esoteric secrets from the past that we have since forgotten, while others ridicule the legend and scoff at the idea of feeble man accomplishing the construction of Ed’s Magnum Opus: Rock Gate. But the physical evidence remains overwhelming, and the legacy of Ed and his beloved Sweet Sixteen remains alive in the minds of those willing to explore the impossible and unravel the cryptic riddles of a most peculiar Latvian man. Theories abound as to how Ed accomplished this amazing feat single-handedly. The most mundane and probable of these revolves around the notion that Ed had an innate understanding of rock quarrying as well as physics and used these principles to cut and leverage massive blocks of stone. But many feel that there is more to the mystery of Leedskalnin, who worked in secret and openly admitted to using the same techniques as the ancient Egyptians responsible for building the great pyramids. Some of the more bizarre ideas focus on various forms of levitation involving electric currents, magnetism and the theoretical electro-magnetic grid of the Earth. Many believe that Ed had tapped into this grid at the original location of Coral Castle, only to have the grid shift forcing Ed to move his masterpiece. Others theorize that Ed was utilizing a type of acoustic levitation, citing neighbors’ claims about hearing singing emanating from the property during the nights Ed was working. This is also supported by claims from the Eastern half of the world, where reports have surfaced that Tibetan monks have successfully levitated boulders hundreds of meters up mountain cliffs using nothing but massive drums and horns arranged in a strategic geometric pattern. Despite the controversy of claims such as these, one fact remains indisputable: Ed Leedskalnin’s accomplishment. How the man achieved this feat is less incredible than just the simple fact that he DID achieve what he set out to do and that alone is greatly admirable. Ed’s legacy will continue to live on in much the same was as many wonders of the world continue to do, leaving all of us to wonder just who this peculiar man was and what really motivated him to build Rock Gate.